tagines; watching sunsets over Marrakech; watching the action in Place Jamaa el Fna in Marrakech. surprisingly more expensive than you would think; some places had very lackluster food. watch the sky lighten up and eventually have the sun appear. Spanish or French, for that matter) - only Arabic and Berber; going to The Spice Doctor's home. 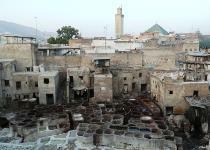 Smells: The tannery in Fes (bad...but not as bad as I was expecting); tagines; street food stalls. you like' (a phrase every Moroccan uses). Bahia (10 dirham); women in full burkas. chickpeas; honey cookies; seafood tagine. Purchases: Small salt and pepper tagines; a vase; a shawl. honey); fresh squeezed orange juice. Interesting Food Finds: Avocado milkshakes. jewelry boxes; leather poofs; spices. since researched this and it is, indeed, an imposter! Visa needed? Not for Americans. Type of currency? The Moroccan Dinar. One U.S. dollar is equal to about 8 dinars. Things Morocco Is Known For: Tagines; couscous; rugs; the Sahara desert; Aladdin. A palmery on the drive to Marrakech.